To the new server – horray! Renato has a TV175 ready to go in Italy for a tour with Suzanne including Monte Carlo, France and Switzerland. 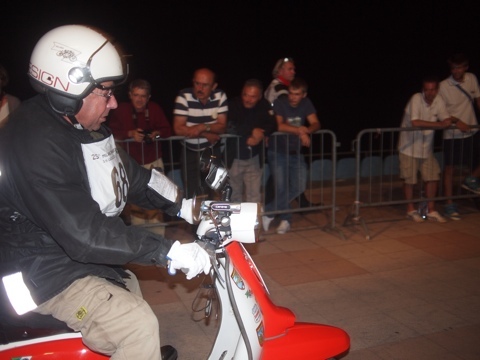 He may also be there for “Lambretta club of Italia Nationals” held in Genoa 12, 13 & 14 May 2016. More updates to come closer to the time. A late post for this year run (given it happened early July 2012). Ron didn’t go on this years Mi-Ta, however, Larry did go (he was the poor guy driving the support van in the 2010 edition for us). 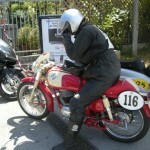 Larry rode his recently restored Ducati motorbike, when I catch up with him I’ll update what machine it was etc. 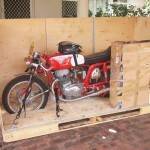 Well, at long last my MV Agusta arrived home from Italy on Friday and I unpacked it over the weekend. Here’s how the MV travelled. Bailey helped get it out. After a clean, service and start. The box it travelled in is a little worse for wear but it has now gone from the USA to Australia and then from Australia to Italy and finally from Italy back to Australia; so its doing very well all things considered. 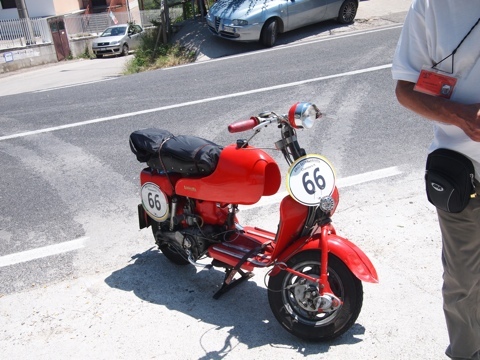 After cleaning the carbi’s and spark plugs the engine runs beautifully again, such a nice engine and good looking bike that took me the length of Italy and then over the Stelvio Pass. I am lucky to own something that has been that reliable – it would be very hard to ever sell. 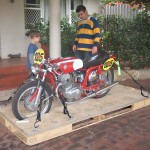 I think I’ll take it for a ride this weekend, will be great to ride again. 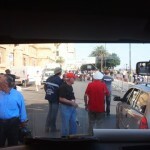 That’s me going through the line in the van. The Japanese have the photo of Ron and will email it to me they also saved the other photos that I deleted. 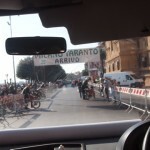 The last day, although very short, was very hot and by the time we reached the last check point and waited for the food to come I had had it and went inside the council house and cooled down along with some other people. Then it was on to Taranto and ALL the speeches, they went on and on. Ron and Siobhan both got two trophies and a pin. It was then time to farewell the other van people namely Malcolm, Colin, Howard and Mike; they mad the trip very enjoyable for Akiko and I even though we have had many hours of heat, rough riding and no air condition but laughs were plentifull. If anybody thinks that the ride is a walk in the park they are very mistaken, fortunately no body was killed this year but several had accidents and were walking around very slowly. Ron did a great job of finishing without mishap and Siobahn’s bike was repaired so she was able to finish as well. After a good sleep and not so early start we were off to Milan via the Adriatic coast. 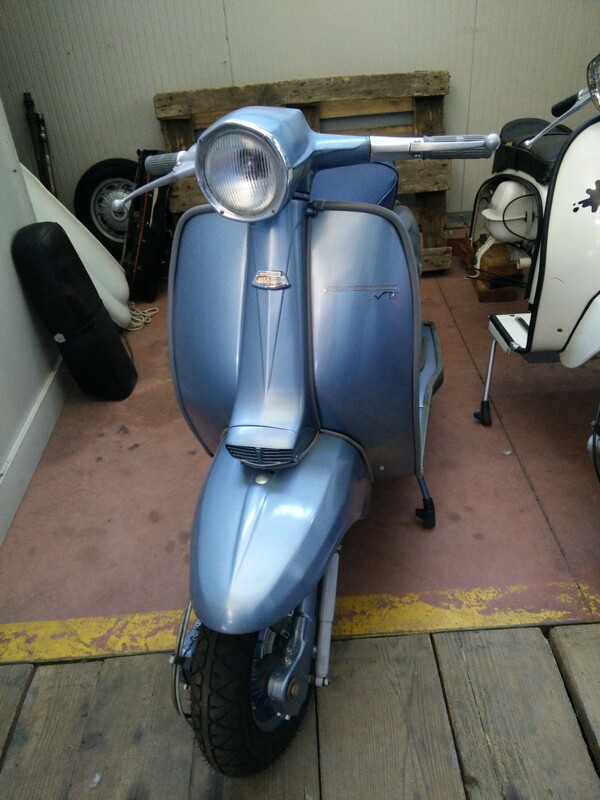 Soibhan needed to get some repair done to her scooters forks so we are going to Torchiarolo where the Lambretta dealer is going to fix it for her today, a Sunday. The people are very generious, we are staying in a B&B nearby and will head off in the morning. We have hired a car, an Audi, with air conditioning soft seats (what a dream) and will follow Ron and Siobhan over the next few days until we reach Milano. I have used up all the batteries in all the cameras so no more photos. Here are some photos up to date, have not got the ones missing yet but the Japanese have recovered them onto their computer, just need to get onto mine. The day was full of caios. We set off fine but before long found Siobhan broken down, loaded her up and set off for the first check point. 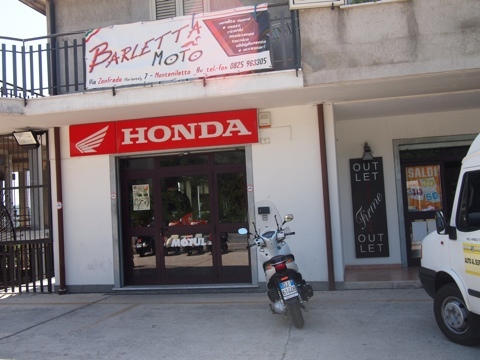 As we were passing through a small town she saw a Honda dealer and we stopped to see if they had a spare electronic ignition. Just when we were off loading her scooter Howard rang me he had had an accident had hit a car and needed us, so we left Soibhan, and head off to Howard . I rang Donato to organise the Lambretta Van to pick Siobhan up. By the time we reached Howard the police and ambulance were there. He would not get in the ambulance so after we picked up the scooter (a write-off) we headed to the check point but by the time we got there they were packing up. After many phone calls and directions the Van found Siobhan so everybody was taken care of. We made up time as the rest of the course was very flat compared to the other days. It was very hot in the van and we were very happy to reach the sea side . 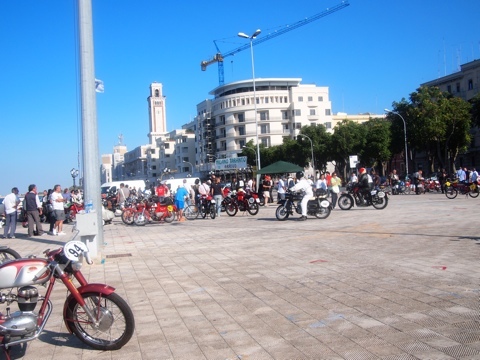 We did not go through the town of Molfetta just around the sea edge which was a bit disappointing as my sons mother in law is from there and we had once spent a Christmas there. We reached Bari, again through the outskirts without actually going through the middle of the city, and assembled by the sea. Everybody happy to be cool. Later, after we had found the hotel then Siobhan asked where Akiko was. She was traveling with the Japanese again and we had not seen her at the finish and thought that they would drop her off at the Hotel. 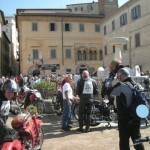 Each night two hotels were needed for the 400 odd people travelling with the race which includes followers and marshalls. Colin and Malcolm tried to find the other hotel but the gps could not find it. FInally, after many phones calls via Japan to people who do not speak english she finally arrived on the back of a BMW motor bike – talk about total confusion! That night we had a fish meal and returned to the Hotel for a good sleep. Howard is OK this morning apart from a huge bump on his eye socket, bruising and cuts. Late start this morning as last day. I know that it has been a while but what things have been very rushed and no time to think let alone blog. If you are not on the road you are rushing to eat and then sleep; the meal of the first night, which was put on by the locals of Zola and was very nice, did not end until very late. The next day was a 8am start and of to the first check point at Peitramala, the route was very mountainous and scenic but no time to stop and take photos. Ron enjoyed the trip as the weather was cool. Unfortunately Mike, one of the English guys, came off and was hurt but went on . His brake was a little damaged but mainly the light so all OK. 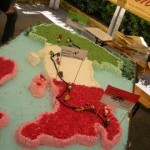 This day was 322km with check points at Pietramala, Dicomano, Bibbiena and Ripa, all supplied us with good food and drinks. We, in the van, were a long way back from Ron, getting very lost did not help but it did help one of the Italians who was also lost, very, and out of fuel. We eventually got back on route and it had started to rain rather heavily. We then received a call from Howard to say that he was having fuel trouble. We loaded him onto the van and set off to the Hotel arriving late and having to once again rush to get ready for the meal. 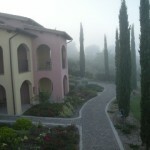 The hotel was beautiful but not there long enough to take advantage of it. The nights meal was in a huge castle on top of the mountains which we left for it at 8.30pm by bus. As soon as we arrive we just had time to have a quick look at the scene and then on with the largest meal I have ever seen. 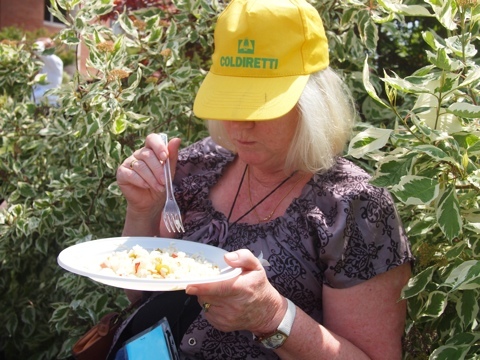 The food did not stop coming, nor the wine until 12.00pm. Then onto the bus back to the Hotel by 1.30 and into bed to start again the next day at 7.30am from the hotel then to the days start. 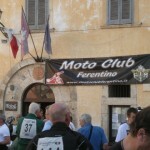 Day 3 – Torgiano to Ferentino. There was great discussion as to what was to happen to Akiko and me because Mike’s shoulder and Howards bike my not have been OK for this days travel. 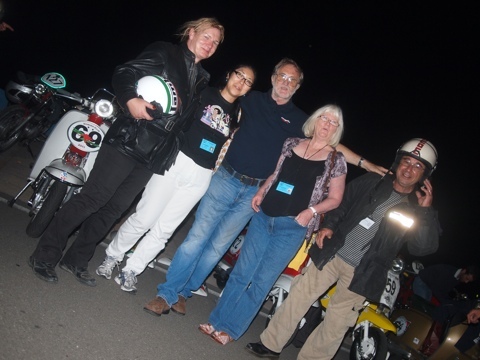 We had made friends with some Japanese, a rider and two people filming, and had eaten with them each night. Akiko asked if we could travel in their car, air conditioned, and they said Ok, so we traveled with them all day. The scenery was out of this world. The ride was very hot and Ron was very tired but at the end of this stage he was equal third in the scooter class. 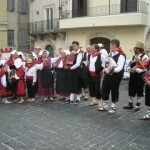 The people of Ferentino put on singing in the town square, it was very good and every body appreciated it. We started a much more reasonable hour, 9 o’clock, from the hotel not so many mountains today and much shorter at only 187km. 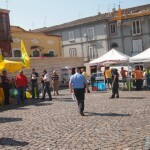 Passing through Vairano Scalo, the town put on this huge spread with everything you could think of. 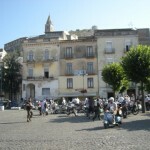 Soibhan’s scooter had a small breakdown but nothing major and is now OK.
We are now in the hotel in Caserta. 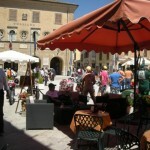 Unfortunatly I have lost the photos for the last two days but will download from Rons camera. 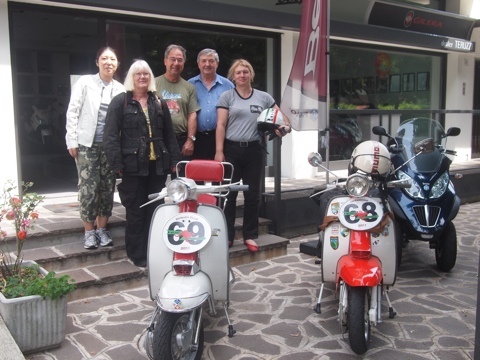 Todays are Ok.
After the Lake Como attempt the repairs all completed we went to Bricks for a meal to meet the Amicie di Lambretta. Amongst them were the English team of Howard, Mike, Malcolm and Colin. Howard and Mike are riders and Malcolm and Colin drive the backup van. They agreed to take Akiko and me along as well so we were all set. 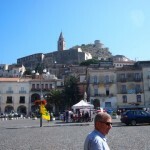 The next day (start day) we packed and loaded the van and then while Ron and the others went Idroscala for scrutinizing we stayed at the B&B and waited until they returned as we were going, once more, to Bricks for a final meal. We left Bricks aroung 10pm and proceed to the start all a bit uptight as you would expect. There were a lot of people at the start and so the Big adventure began. 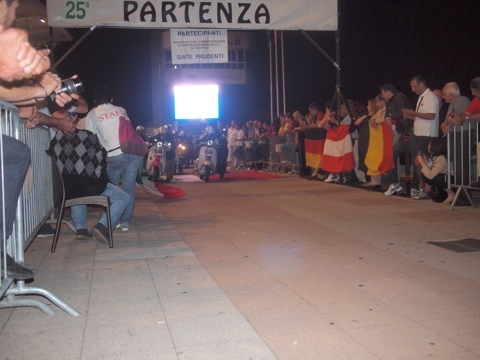 The first day was from Milan to Zola around 347km plus 60km to the Hotel. Many people in the villages watched as we passed by even though it was after 2am. At the first check point we had lost Howard and Mike and we spent an hour waiting for them and then decided to go on. They had decided to skip the first two check points and as it turns out Howard skipped the last one as well. Words were had and all should be good from know on. 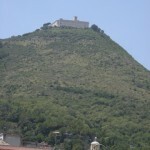 The leg from Spilamberto to Monteombraro was very mountainous and beautiful and dangerous. We saw a car being pulled up from over the side of the mountain. Not one of ours thank goodness. However one of the riders was hit by a car during the night and bike was badly damaged as was her leg, but she is up and about. At each stop we were feed food and drinks, a very welcome thing. I hear Lake Como is nice in the Summer….. 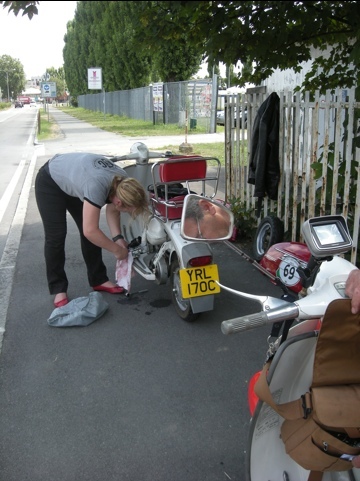 Yesterday we were going to lake Como for a run to see if Siobhan’s scooter was Ok.
We managed to go about 8km before things started to go wrong. The throttle stuck and the engine raced. 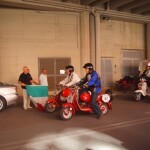 So we stopped,near Meza, next to a cript. The day was very hot and Akiko and I were not very happy. Siobhan found out that she needed another nut and bolt as the bolt on the carbie snaped. 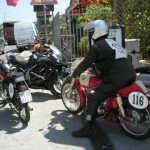 A pasing motor cyclist was asked directions to the nearest place to get the part. Unfortuantley it was just on lunch time and every thing shuts for two hours, except the food outlets. So we had a great pannini and waited for the business to open. 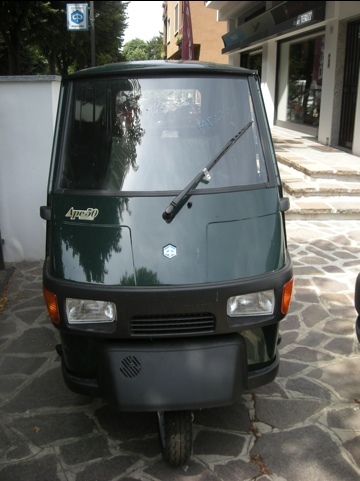 The only place that we could get the items needed was a Piaggio agency. THe boss was not very happy to help at first as he thought that we wanted him to fix it, but after explaining that we only need a bolt we became best friends and he took many photos . I loved the new three wheeler. As I have only seen the old labretta ones at home. After things were fixed we continued on to Gorgonzola here a man came up and we asked directions to the lake. 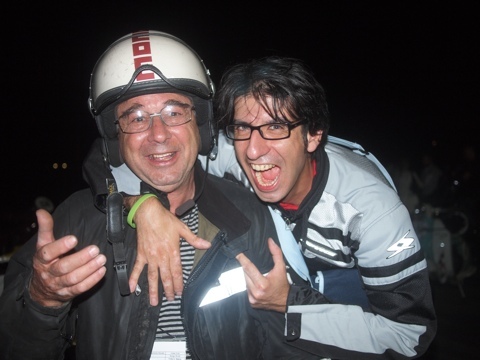 He offered to drive in front of us as far as Monza which he did and then left us to our own devices. People on the way when we stopped for the lights asked as what we were doing etc. Just like when we were traveling around a couple of years ago. We decided not to go all the way to the lake as it was getting late and the trafic was getting very bad. We arrived back at the B&B and made our own meal. Siobhan discovered on the way back that her kick start was bent and spent the best part of today replacing it. 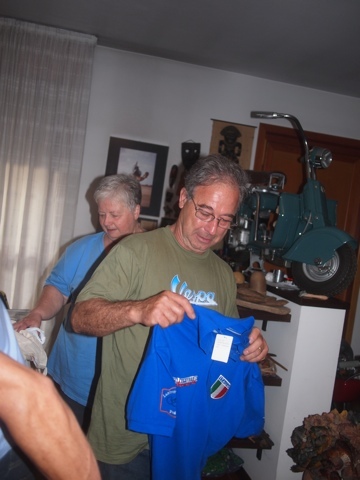 Donato and friend came round this afternoon for a visit and his throttle cable broke. So Ron had to give him a spare. Goodness me and the race has not even started yet. While they were fixing the scooters Akiko and I watched the Monaco royal wedding. 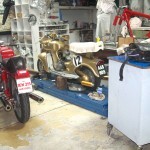 Vittorio of Casa lambretta in Italy has been most generous allowing us uninterupted use of the workshop and parts. Without this Ron and Siobhan would not have been able to manage. 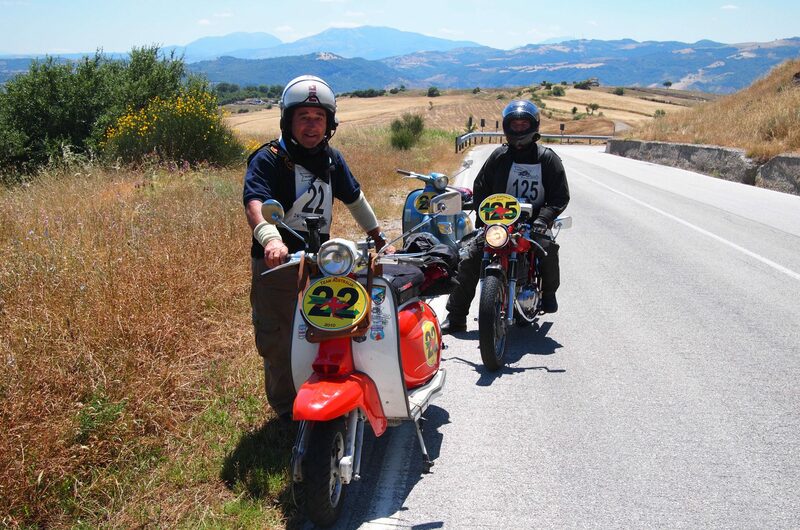 Was not too bad.Tino had returned from Euro Lambretta that morning at 2.30 am The event was held in Ireland this year very wet. 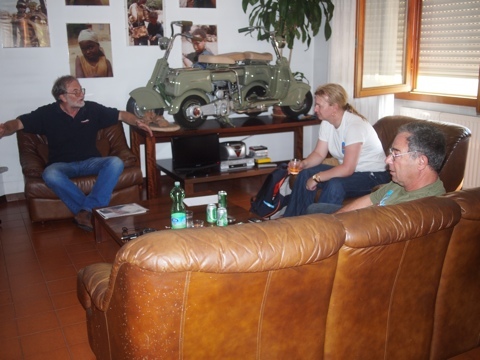 As you can see they have Lambrettas everywhere even in the living room. Ron cannot understand why he can’t do the same. 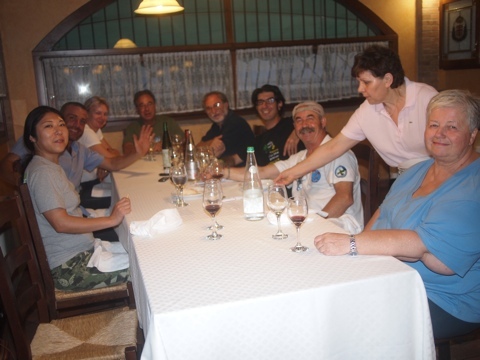 We then went to a local restaurant Not Bricks, for a meal joined by other enthusists. Two of the men are going on the race with us Carlo sitting next to Akiko is one of the organizers and has had the T shirts made . We will get them tomorrow at a dinner. Siobhan had to fix her brakes this morning and Ron needs to fix the extra light to the scooter as last night returning to the B&B around 11pm was a bit hairy as the road was very windy and no street lights but we arrived safely and had a good sleep. To day is a little cooler thank God. There is talk of us heading off to Lake Como today for a run it is now 11am and it is about 50km to the Lake so we need to get going soon.Ron has to go to Donato’s this evening to find the light bracket so I don’t know where I will eat and realy that is the most important thing after all.